A strong PE bag (e.g. a drawstring bag) is desirable for keeping all clothing together. As space in the cloakrooms is severely limited, please help us by providing a bag which does not take up too much space and which can be hung easily on a peg. Children should wear standard plain shoes or sandals, fashion shoes are not permitted. We encourage plain accessories (socks, hair ties) etc, either in white, black, grey, navy, blue or yellow. Long hair must be tied back with a soft hair tie for PE. Jewellery, nail varnish, wrist bands, make-up, stick on tattoos and other such adornments are not appropriate for school and will be strongly discouraged. Children with pierced ears may wear simple stud earrings but these must either be removed or covered with adhesive tape for PE – it is the child’s responsibility to do so. Children may wear watches but they should be suitably unobtrusive in terms of colour, size and beeps! Children must remove watches for all PE and we cannot accept any responsibility for their loss or damage. 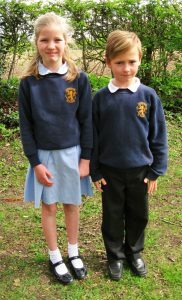 All school uniform is available by logging onto pmgschoolwear.co.uk and clicking on Cumnor School, or by collecting an order form from the school office. Items of good quality second-hand clothing can be purchased through the PTA. Please ask at school for details of who to contact. Lost and found property, other than clothing, is kept by the School Secretary. Clothing is placed in a lost property box kept in the KS1 corridor. Please ensure all clothing worn by your child in school is clearly named – this includes coats and shoes. We make every attempt to reunite named property with its owner. At the end of each term all remaining lost property and clothing is laid out on a table in the entrance hall. Unnamed clothing that is still unclaimed is then recycled or disposed of.